Although I have a long list of gadgets tucked in ref magnets on my mirror here, (actually they’re kitchen gadgets, just in case my mil would tell me to pack my things and leave I have things to bring with me that’s my own, lol. 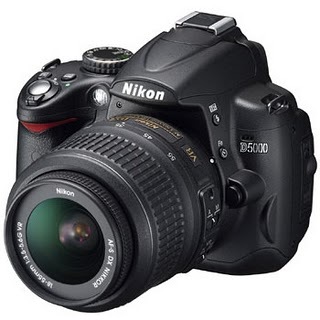 Because as I have said before, everything here is provided for) this baby, although not a priority, is one of the deepest desires of my heart – a Nikon D5000. I think I need not to elaborate why, I suppose you’ve known it long before that the marriage of camera and blogging is now an institution in this industry. All I want is a stable marriage partner, lol. I’m married to an Olympus T-100 digicam right now, which I tell yah people who let it out on the shelves, it’s a waste of money, I had it on my hands for 6 months now and it’s damn no good, sometimes I would think this camera is color blind, It focuses on true color and comes out different, gezz. But I bitterly love it because it’s the only partner I have and I bought with my blogging moolah. Anyway, thank God I posted all four for April; I hope I’ll win a blog make-over from Kaye. GT visit to your blog! I'm drooling over DSLR thing as well; am just sticking with my 12 mega pix digicam as of now! goodluck to all GT followers,wish you all the best too in this month's contest @ GT! a DSLR is indeed to die for. =) every photo turns out great and it seems to make any people subject a little more beautiful. kumbaga, laging pwedeng pang-FB profile pic. =) happy GT! We share the same dream...this model or D7000. Here's my GT entry, hope you can check it out. Thanks! Come and see my dream gadget. Never hesitate to drop by my STREET. hahaha! it's true what you said, that blogging and photography come in package these days. great blog. will follow you. hello sis. thanks for dropping by. wow congrats, you completed all 4 entries for this month. hope you win the make over. as for your question regarding my blog theme, i do my own themes po. hehe. sis, have you tried shooting manual? I love Olympus cameras too! anyway, I understand a lot of people are wanting good cameras. it's really helpful in blogging. Was here visiting you back sis from my meme blog Cup of Meme. Thanks for looking for this week's GT. Grabbed your badge nga pala sis, pero I placed it on my main blog El Oweini's Life. Followed you as well. Thank you. See you around. another cam? wow... it's a favorite. even my 16-year old daughters wants one, lol! mine's HERE by the way.. I'm Katrina from Mystic Nymph. i have for the longest time a sony touch screen t series digicam. it's somewhat oldie, but works fine with me. am sure this baby will be in your hands pretty soon...ikaw pa, kadako sa imong kita...ehehehe! hi vernz...hi naku, to die for talaga yang mga dslr. pero pag meron ka na, to die for na naman ang mga lenses..what made u choose Nikon d5000? anong meron sa kanya na wala sa iba?